Jeremy Michael Hall, 40, of Hollywood, MD passed away on April 8, 2019 in Leonardtown, MD. He was born on August 10, 1978 in Leonardtown, MD and was the son of Edith Dawn Hall and Joseph Michael Hall of Hollywood, MD. Jeremy is survived by his children Austin Michael Hall of Hollywood, MD and Margaret Lillian Hall of Mechanicsville, MD. As well as, his sister Laura Lindsey North of Piney Point, MD. He was a lifelong resident of St. Mary’s County, MD. 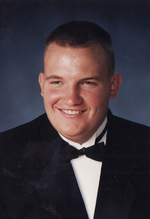 Jeremy was an auto body repairman and painter for Southern Maryland Collision and Restoration in Mechanicsville, MD. Jeremy loved riding motorcycles, dirt bikes, and four wheeling. Along with being on the water, fishing, and could navigate local rivers easily. He loved hunting, dogs, and in particularly Rottweilers. In addition, he grilled the best chicken, and burgers. He was the go to person if you wanted a car washed, waxed, and detailed to perfection. Furthermore, Jeremy loved little kids and family. The family will receive friends on Tuesday, April 16, 2019 from 2:00 PM to 4:00 PM and 5:00 PM to 8:00 PM in the Mattingley-Gardiner Funeral Home Leonardtown, MD. A Funeral Service will be held at 7:00 PM in the Funeral Home Chapel with Deacon Ammon Ripple officiating. Interment will be private. To send flowers to the family of Jeremy Michael Hall, please visit our Heartfelt Sympathies Store.